For example, China protested penalties that Washington officials imposed last month on ZTE, a Chinese telecommunications company, for repeatedly violating American sanctions on Iran. The Commerce Department banned all shipments of American wares to ZTE, including chips and other equipment essential to many of its products. The move appears to have strengthened China’s resolve to continue its drive for self-sufficiency and to curb imports in a variety of high-tech fields. China’s push to upgrade its technology accounts for many of its disagreements with the United States. The American document reiterated Trump administration calls for a broad halt of Chinese subsidies to manufacturers in advanced technology industries. Beijing’s $300 billion Made in China 2025 program calls for extensive government assistance to build domestic industries in aircraft manufacturing, semiconductors, artificial intelligence, robotics, electric cars and five other sectors. Chinese officials defend the program as essential to upgrading the economy and have said that they would not agree to any limits on the Made in China program. The document also highlighted China’s trade surplus with the United States. It called for a reduction of $100 billion in the coming 12 months and a further $100 billion in the following 12 months, the document said. The American side also said that it wanted to be able to impose new restrictions on Chinese investment in the United States for national security reasons without any retaliation by Beijing, and with an agreement by China to reduce its own investment restrictions. The United States also asked that China cut its tariffs on imports by about two-thirds to match those in the United States. China, which now has a manufacturing sector nearly equal in annual output to the United States and Germany combined, contends that it is still a developing country and should be allowed to retain higher tariffs. Chinese officials have said that they would be willing to reduce some trade barriers, but only if the United States also lowered trade barriers. Chinese officials particularly object to American limits on the export of high-tech goods that have both civilian and military applications, contending that these restrictions prevent sizable potential exports. They also objected to United States demands for a specific cut in the bilateral surplus. Li Gang, the vice president of the Commerce Ministry’s research and training institute, said in a separate interview last month that a $100 billion cut in the surplus was “impossible.” China’s surplus has been widening lately as the United States economy grows fairly strongly and takes in more imports. 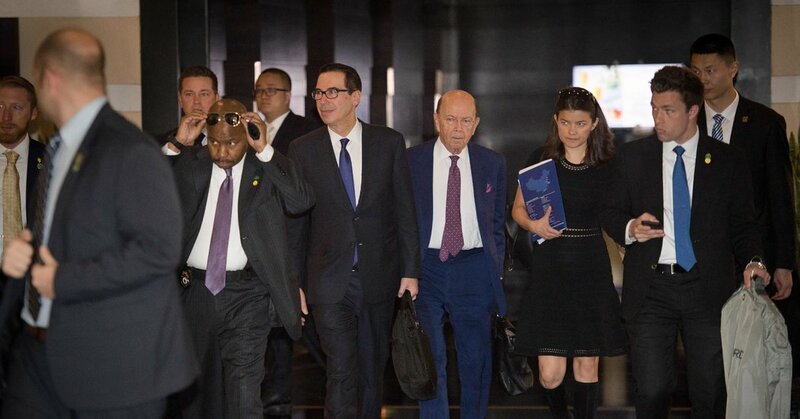 The Commerce Department announced on Thursday in Washington that the trade imbalance with China had widened slightly further in March compared with the same month a year ago, although it narrowed slightly compared to February, possibly for seasonal reasons. The lack of a deal this week, and the failure to schedule further talks right away, does not rule out the possibility that Chinese negotiators will visit the United States next month for further talks. One possibility that American officials have considered is whether China might send Vice President Wang Qishan, who is close to President Xi Jinping, on a follow-up trip. So far, the Chinese side has been led by Liu He, a Politburo member who is also the vice premier for finance, trade and technology. Trade experts have been saying for weeks that Chinese officials would like to resolve the dispute with the United States so that they can go back to focusing on issues closer to home. “That’s the immediate problem, because it’s a headache for them that’s distracting from a very pressing domestic agenda,” said Christopher K. Johnson, a former C.I.A. officer who analyzed China and now holds the Freeman Chair in China Studies at the Center for Strategic and International Studies. The Beijing talks were unlikely to result in a comprehensive deal, but experts said they could still be a first step toward reaching some sort of accord.